No joke, you'll be paying less than you would for a designer bag. We’re having a proud, patriotic moment right now. Dubai-based Filipino designer Michael Cinco just debuted at Haute Couture Week in Paris to much acclaim! The collection featured the show-stopping gowns and dresses Michael is known for—without the extremely high price tag couture carries. According to PEP, Michael collaborated with British collective COUTURíSSIMO for an exclusive line of couture-level designs at inexpensive price points. We’re talking an average of P20,000 here, CGs—way less than you would spend on most creations of this quality. Michael’s designs are currently available for pre-order on COUTURíSSIMO.com. It includes such gems as these stunning lace LBDs—$390 (P18,244) and $419 (P19,601), respectively. And this floral series, which includes a knee-length shift dress ($290 or P13,566), a full midi dress ($449 or P21,004), and a long-sleeved column gown ($439 or P20,537). That's no small sum, of course. But a significant number of ready-to-wear formal dresses here in Manila would already be around the same price. Many custom-made designs, on the other hand, would cost more. So if you're on the hunt for something special to wear to a wedding, for instance, you know where to look first. 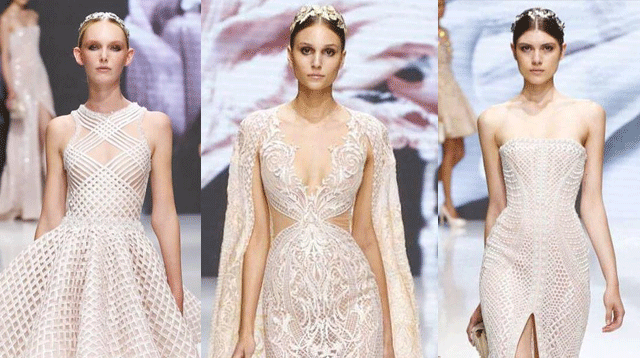 Check out the rest of Michael Cinco's collection for COUTURíSSIMO here.